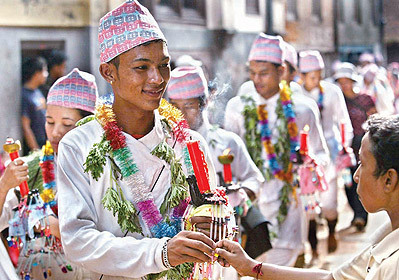 Mataya is a unique Buddhist festival of Patan to be held in the month of August. This day-long journey around the historical city starts at the dawn, on the third day of the dark fortnight of Shrawan (August). Very few cities in the world compares with Patan (Lalitpur) in the richness of its cultural heritage - a claim that really makes sense, especially when you are talking about something with the unmatched wonder of – Mataya Festival. This word "mata" means 'lights' and "ya" festival or also means to a sacred 'journey'. Another form of interpretation is that Mataya or Matya in Nepal Bhasa i.e. not conquered (by the Maras). Being defeated Mara, the god of desire submits to the Buddha and pay homage to Lord Buddha for confession. In this event people participate in this festival to worship Buddha and also for accumulating merits for the dead. Devotees process to all the Buddhist shrines inthe city, offering rice grains, flowers and lighting candles. Men and women walkin a line of thousands between these musician groups and do puja at the votive shrines (chaityas) carrying lighted candles and torches. The preparation for Mataya begins on the first day of Gunla. After mid-night on this day a group of some hundred people with nava bajan (traditional Newari musical ensemble) gather and follow the exact path that they are to follow on the day of Mataya. They don't finish the whole route on a single go, but gather every night for a few nights and markthe shrines and courtyard with vermilion, husked rice and coins as they pass. This eventis called Bogiwonegu. On the grand day of Mataya, massive number of devotees, sometimes as many as several thousand, gather at the locality that is in charge of the festival for that year.There are ten different localities which take turns to organize the festival by sponsoring instruments, musicians and all the other expenses. This year's (2012) Mataya is organized by the Koh-Bahal locality. They gather at the lead locality dawn and start their yatra with a hint of excitement and uncertainty in their cheerful faces; for they must walk all day long often bare-footed and fasting. It is a greatscene to watch people prepare for their procession around the four principal Ashoka stupas spread in and around the four corners of Patan. They must all visit all the 1400 private and local votive shrines scattered in the city on their way.